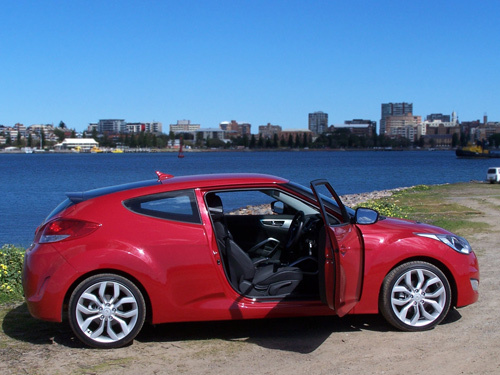 This time we spent some quality time driving the new Hyundai Veloster finished in Veloster Red. 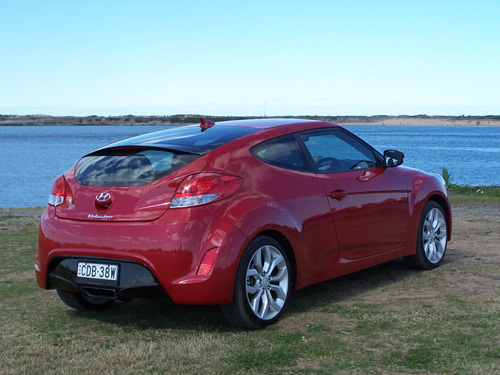 The Veloster is Hyundai’s long awaited replacement for the sporty Tiburon. The new car was released in Australia in February this year. Hyundai have opted for a distinctive exterior design for the Veloster. The intention is to combine the styling of a coupe and the convenience of a hatchback. The result is 3 doors. The Veloster is all new with distinctive styling having 2 doors on the nearside and a large wide opening door on the offside. It is a four seater with smart looks. The Veloster offers spirited performance with smooth gear changes in the double clutch automatic transmission although the acceleration isn’t neck snapping. For those wanting more pace, Hyundai has released the Veloster SR Turbo which offers almost half as much power again at 150kW and 60% more torque at 265Nm. The Veloster sits on 18 inch rims with 215/40 R18 tyres. 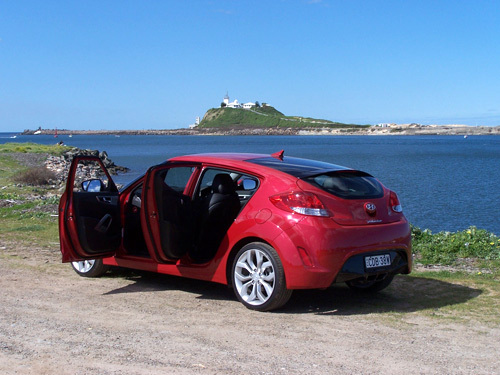 The team spent only a week driving the Hyundai Veloster, covering 577 kilometres of mainly suburban and inter urban roads. The package attracted a lot of attention and questions where ever we stopped thanks to the exterior design detail. It is extremely functional for the motoring family of four, excluding the understandably smallish cargo area when the rear seats are occupied. 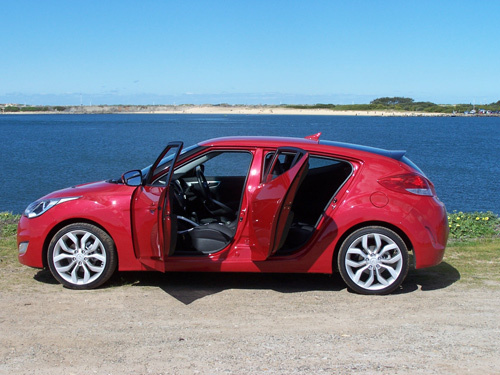 With a seating capacity for 4 people and three doors this package is easy to live with. No worries about small children jumping out of the unit onto busy roadways, it can’t happen due to the configuration of doors. The unique layout means there is only one rear door and that is on the passenger side of the car. The rear door has a child lock function if you need it. The steering wheel can be adjusted by both rake and reach and driver comfort is more than reasonable. It is also fitted with a clear reversing camera which is displayed on the 7 inch colour LCD screen. p>The rear seat allows for split folding 60/40 to create a decent sized cargo area. With the back seats upright, the boot space is still reasonable for a sports car. The Veloster can be finished in some loud colours if you like attention. The most outrageous is probably Green Apple but Sunflower (yellow) is almost as distinctive. The 1.6 litre, four in line cylinder, double overhead cam, 16 valve, GDi (Gasoline Direct injection) petrol power plant was not put out place during our time in this package. A quiet achiever that was not over bearing in performance mode and still returned reasonable fuel consumption, 7.3 L/100 according to the trip computer. Maximum power of 103kW is reached at 6,300 RPM while peak torque of 166Nm arrives at 4,850 RPM. All Veloster models are front wheel drive. 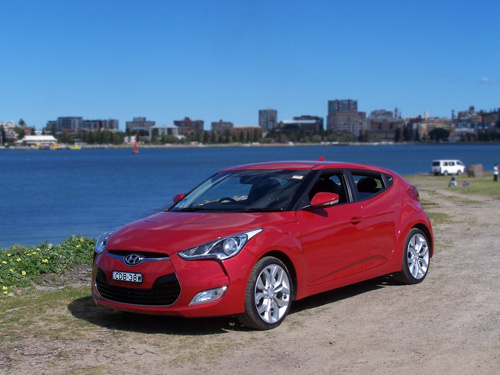 A 5 Star ANCAP rating has been achieved by Hyundai Veloster, the maximum available for vehicles sold in Australia. Front driver and passenger airbags, dual side front (thorax) airbags together with side air bags protect all the occupants in the event of an accident. Our drive package is fitted with ABS, EBD and BAS with Hill-start Assist Control (HAC) which is only fitted to vehicles with the DCT (auto). ESC, TCS and VSM (vehicle Stability Management) are also featured as standard equipment. 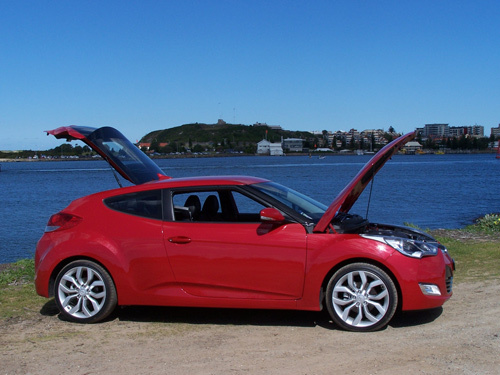 Hyundai claim the Veloster can achieve a reasonable fuel consumption of 6.4 litres of unleaded per 100kms on the combined cycle based on ADR81/02 – for both the dual clutch automatic and manual gearbox. We did not check this figure, although as noted earlier the trip computer showed average fuel consumption of 7.3 litres per 100kms. p>A fuel tank of 50 litres ensures a reasonable trip distance. Combined CO2 emissions are 151g per km with the dual clutch transmission. With the 6 speed manual gearbox, emissions are slightly higher at 153 g per km. Veloster has impressively high levels of equipment including dusk sensing headlamps, with LED daytime running lights with security delay at night. The interior is dominated by the 7” LCD display in the centre of the dash. This screen displays the reversing camera images as well as the audio functions. Connectivity options are good - Bluetooth is standard and allows phone connection and audio streaming. The audio, phone and cruise control switches are mounted on the steering wheel spokes for ease of operation. Auxillary audio input is also possible which allows for iPod connection. In addition, to the camera, the Veloster is equipped with rear park assist. The Veloster is now available in three variants. 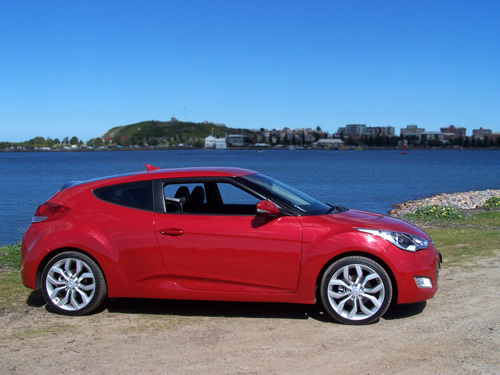 The test car is the entry level Veloster which is priced from $23,990* before on road costs. The automatic transmission adds $2,000* to the price and metallic paint adds $595*. The Veloster+ is loaded up with more equipment, including panoramic glass sunroof, climate control, leather seats, folding mirrors, push button keyless start and colour inserts in the wheels. All this kit pushes the price of the Veloster+ to $28,990*. Again, the auto adds $2,000* and metallic/mica paint adds $595*. The faster Veloster SR Turbo is based on the Veloster+ from an equipment level and as the name suggests, it’s turbocharged. Visually it gets different wheels, and a sportier rear diffuser. Of the six exterior colours offered on the SR Turbo, four are exclusive to the top end model. The SR Turbo is priced from $31,990*. The Veloster warranty package operates, with conditions, for the first five years of registration with no limit on kilometres travelled. Roadside assistance is available for the first year of registration. A 7 year roadside assist package is available as an option at time of purchase. Service intervals are 15,000 km or 1 year. Capped price servicing operates for the first three years of ownership. In the Veloster, Hyundai has struck a great balance between fun styling, good driving dynamics with decent fuel efficiency and a good price. We would’ve happily continued driving this car. 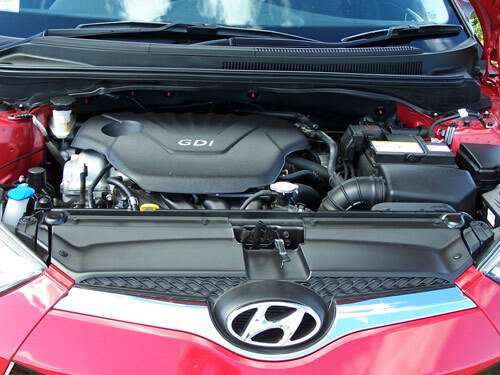 More Hyundai News ..... here. NOTE: * Manufacturer's List Price (MLP) excludes dealer delivery fees and the numerous statutory charges (commonly known as on-road costs). Additionally, please note that all prices, fees and charges are subject to change without notice, as are the specifications. Luxury Car Tax (LCT) is effected when options are added to the car.